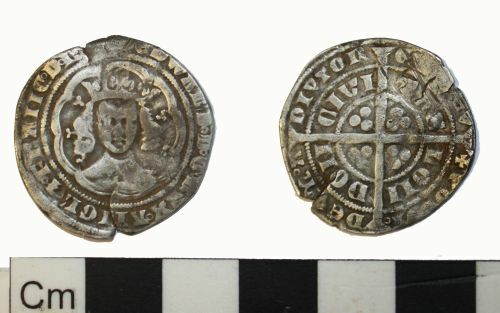 A Medieval silver groat of Edward III (AD 1327-1377), dating to AD 1354-1355. Fourth Coinage, pre-treaty series E, cross pattee initial mark. Minted in London. North (1991: 51) no. 1163. The measurment for die axis has been calculated from the attached images. Reverse description: Long cross pattee dividing legend arranged in two concentric circles. Three pellets in each quarter.